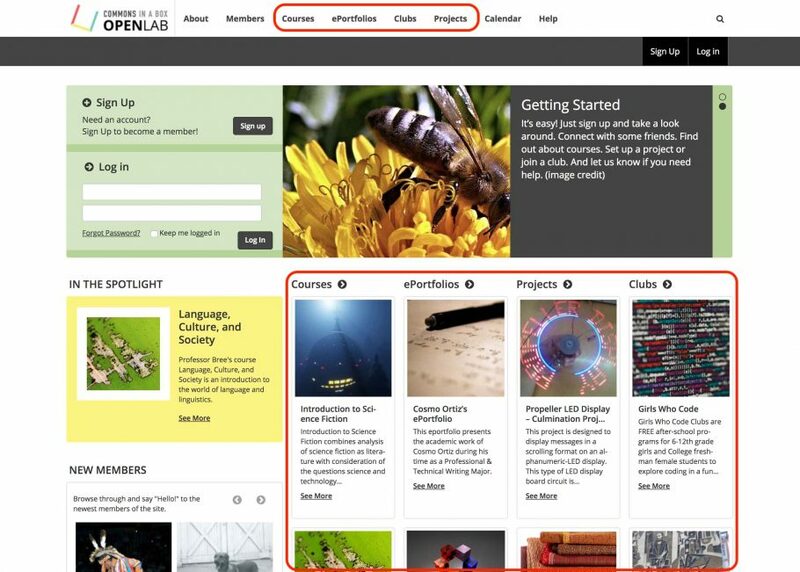 CBOX OpenLab extends the concept of CBOX groups by creating four different types of default groups: Courses, Projects, Portfolios, and Clubs. 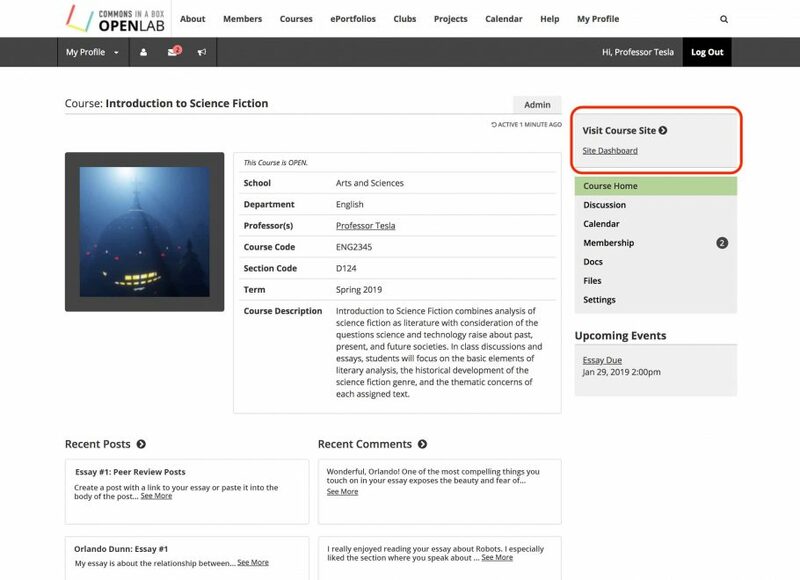 CBOX OpenLab admins can customize the settings for each of these by going to Dashboard > CBOX OpenLab > Group Settings. Click on the “Edit” arrow of any group type to customize. As you can see below, admins can rename any of the four group types, turn group types off or on, change the order, and configure other options. If you decide not to use all four, we recommend three group types as the minimum for optimal homepage display. Two is possible, but not ideal, and one group type will result in a homepage that looks incomplete. 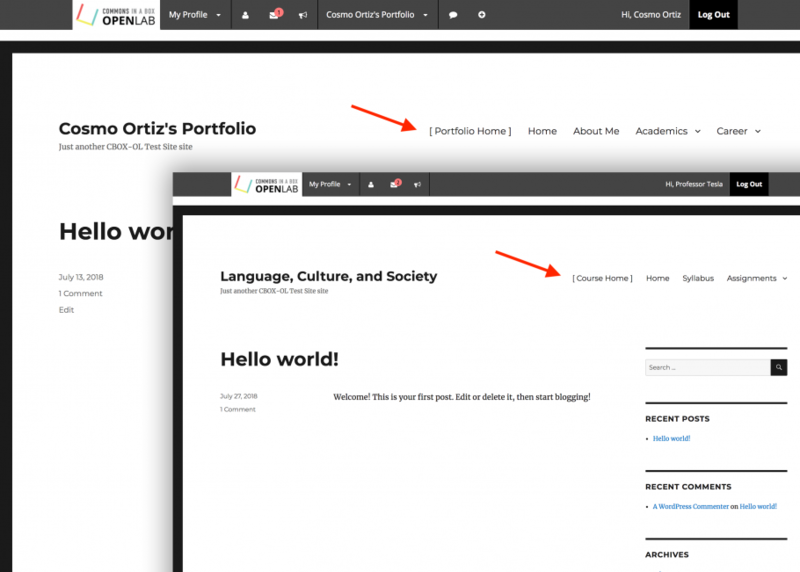 If you decide to disable a group type, you will also need to turn off the display of that group type on the homepage by going to CBOX OpenLab > Brand Settings > Visual. Instructions for this are included in the Brand Settings: Visual documentation. The “Order” setting allows you to change the order in which group types appear in certain places throughout the site. For example, when viewing a member’s profile, group types appear in the right-hand sidebar, and under the member avatar and profile information, in the order specified in these settings. Please note: to change the the order that these group types appear on the homepage, you will need to go to Brand Settings > Visual/Customize > Home Page. Instructions for this are included in the Brand Settings: Visual documentation. 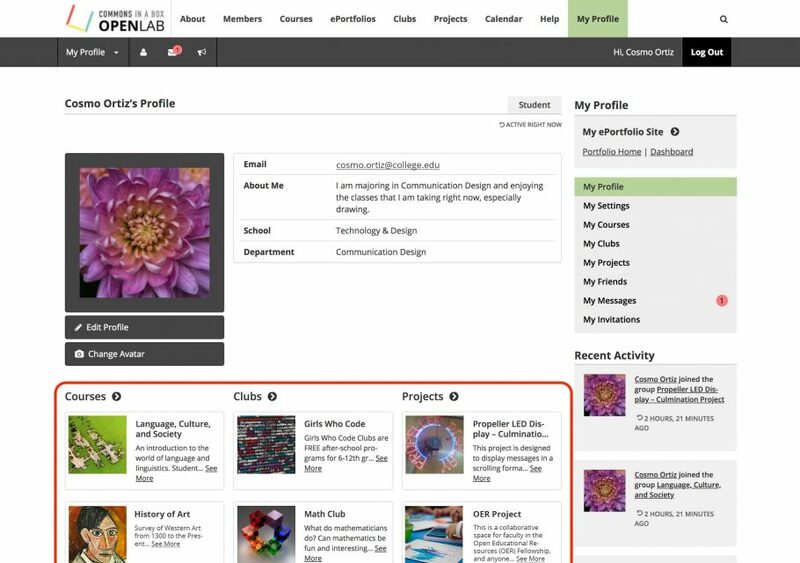 The Labels section allows you to change the terminology used for group types throughout the site, for example on a member’s profile page or during group creation. This list of manual entry terms, while lengthy, allows for translation of the package into any language while still retaining clear and user-friendly language on the front-end. If you keep the default group type names, the labels are unlikely to need any changes, but if you change a group type name, you will need to change it in the labels section. Template sites allow admins to create different default structures for the sites associated with different group types. 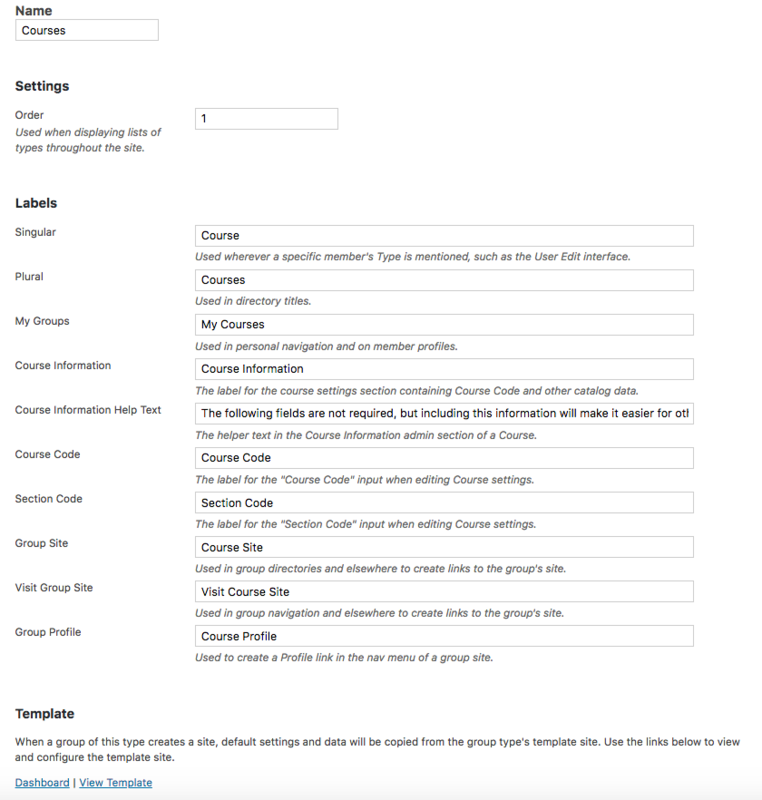 For example, by default Course Sites have a different set of default pages (e.g. Syllabus and Readings) than Portfolio or Club Sites. These default settings can be changed in the template depending on the needs of your community, and can be helpful in streamlining the process of site setup and encouraging best practices for information architecture and navigation. To edit a template, click the template’s “Dashboard” link. This will take you to the Dashboard of the template site for that particular group. You can change any of the elements mentioned above, like the custom menu, default pages, theme, widgets, and plugins, as you would in any WordPress site. Changes will be applied to any new site created for a particular group type, but can be modified as needed by the site’s creator.